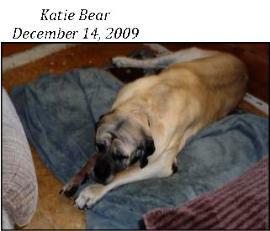 Our Katie Girl, we miss you baby. Since you left us so suddenly, we’ve sat around with the pack & celebrated your life, remembering how you came to us, so shy, so gentle. You knew it was home before we did, remember when we tried to re-home you with that lovely couple? You stayed in their bedroom, refusing to come out until they called us letting us know that perhaps you were not the “right one” for them, but you certainly were the “right one” for us. You’ve been with us ever since. From the get go, you were plagued with so many problems that we addressed one by one, you were always a stubborn Patient but you knew we were trying to help you. What a girl, and we loved you every second of every day. 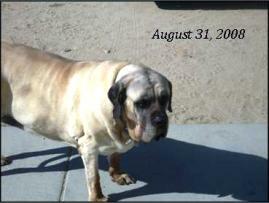 We had high hopes that with Dr. Pelsue’s help, your elbow was finally tolerable but you suddenly became so very ill and this time we were at a loss and in the end, you decided to go to the other side joining your sister “Sassy Girl” who left us in December, 2009. 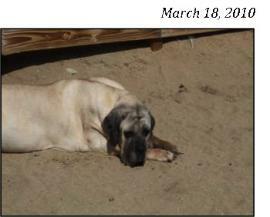 You were our first Mastiff in “Greta’s Garden”, now all the others have joined you —— overlooking Sugarland, keeping guard in your deep sleep. We love you & miss you —- we feel your presence when we visit you each day. 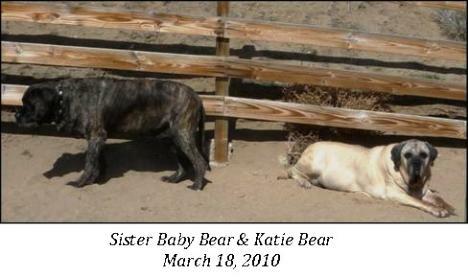 Be at peace our beautiful, fawn, gorgeous Katie Bear Girl.